Astronaut Mark Vande Hei is pictured attached to the outside of the space station during a spacewalk to lubricate the latching end effector on the tip of the Canadarm2 on Oct. 10, 2017. Expedition 54 Flight Engineers Mark Vande Hei of NASA and Norishige Kanai of the Japan Aerospace Exploration Agency are preparing for their exit from the International Space Station’s Quest airlock at approximately 7:10 a.m. EST to begin a planned six-and-a-half-hour spacewalk. Coverage of the spacewalk is now underway on NASA Television and the agency’s website. Sarah Korona, the lead spacewalk officer for today, provided an overview of the activities. The spacewalkers will move two Latching End Effector (LEE), or hands, for the Canadian-built robotic arm, Canadarm2. One will be moved to a long-term storage location for future use as a spare part, and the other will be brought inside the spaces to be returned to Earth to be refurbished and later relaunched to the orbiting laboratory as a spare. NASA astronaut Mark Vande Hei is pictured during a spacewalk that took place Jan. 23, 2018, to begin maintenance work on the Canadarm2 robotic arm. The Expedition 54 crew is getting ready for a spacewalk Friday morning and beginning the work to unload a newly-arrived cargo delivery. Astronauts Mark Vande Hei and Norishige Kanai are completing their spacewalk reviews and readying their spacesuits and tools ahead of Friday morning’s excursion. The duo is scheduled to turn their spacesuits batteries on to internal power at 7:10 a.m. EST signifying the start of a planned six and a half hour spacewalk. The spacewalkers will complete the transfer of a pair of older robotic hands, or Latching End Effectors (LEEs), that were once attached to the Canadarm2 robotic arm. One LEE will be transferred inside the Quest airlock while the other will be attached to the mobile base system. NASA TV will start its live coverage of the spacewalk activities beginning at 5:30 a.m.
Cosmonauts Alexander Misurkin and Anton Shkaplerov opened the hatch to a new Progress cargo craft that arrived today at 5:38 a.m. 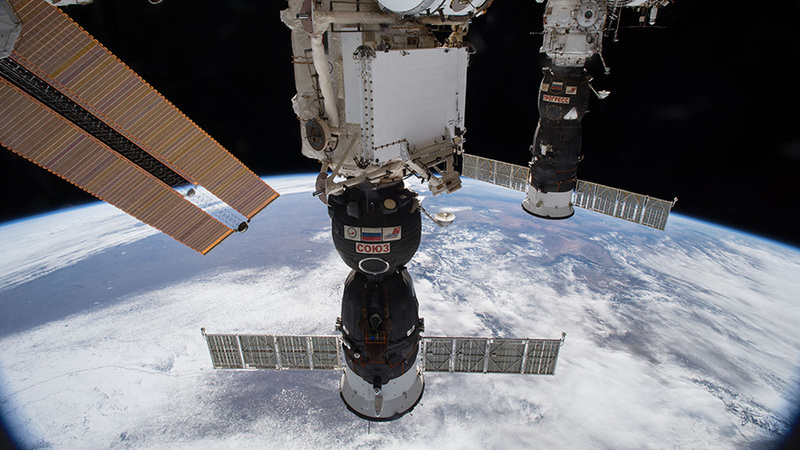 The duo will start the work to offload a little over three tons of food, fuel and supplies from the resupply ship that will stay docked to the Zvezda service module until March. 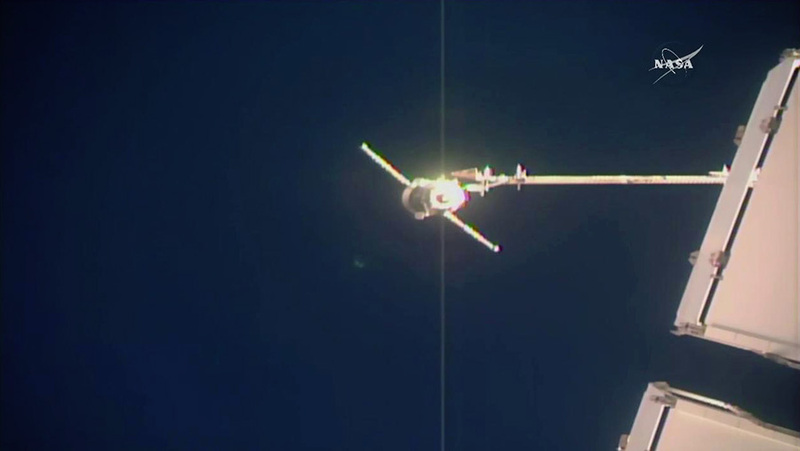 The Progress 69 resupply ship is pictured just moments from docking to the space station. Traveling about 250 miles over the east of the Philippines, the Progress 69 Russian cargo spacecraft docked to the aft end of the service module of the International Space Station at 5:38 a.m. EST. For more information about the space station and its crew, visit: https://www.nasa.gov/station. Russia’s Soyuz MS-07 crew ship (foreground) and Progress 68 cargo craft are seen docked to the Earth-facing ports of the International Space Station’s Russian segment. The Soyuz is docked to the Rassvet module and the Progress is attached to the Pirs docking compartment. A Russian cargo craft is on its way to the International Space Station early Thursday as two astronauts get ready for a spacewalk on Friday. The Progress 69 (69P) cargo craft is orbiting Earth today carrying three tons of food, fuel and supplies for the Expedition 54 crew. The 69P is due to complete its delivery when it docks Thursday at 5:43 a.m. EST to the Zvezda service module’s rear port. NASA TV will broadcast the rendezvous and docking live starting at 5 a.m. Commander Alexander Misurkin and Flight Engineer Anton Shkaplerov will be inside Zvezda monitoring tomorrow morning’s automated docking of the 69P. The cosmonauts are brushing up on their robotics skills today in the unlikely event they would need to use the station’s telerobotically operated rendezvous unit to manually dock the resupply ship. Astronauts Mark Vande Hei and Norishige Kanai are checking their tools and procedures they will use Friday morning during a planned six-and-a-half hour spacewalk. The spacewalkers will complete the transfer of a pair of older robotic hands, or Latching End Effectors (LEEs), that were once attached to the Canadarm2 robotic arm. One LEE will be transferred inside the Quest airlock while the other will be attached to the mobile base system. Vande Hei and Kanai are scheduled to set their spacesuit batteries to internal power at 7:10 a.m. signifying the official start of the U.S. spacewalk. 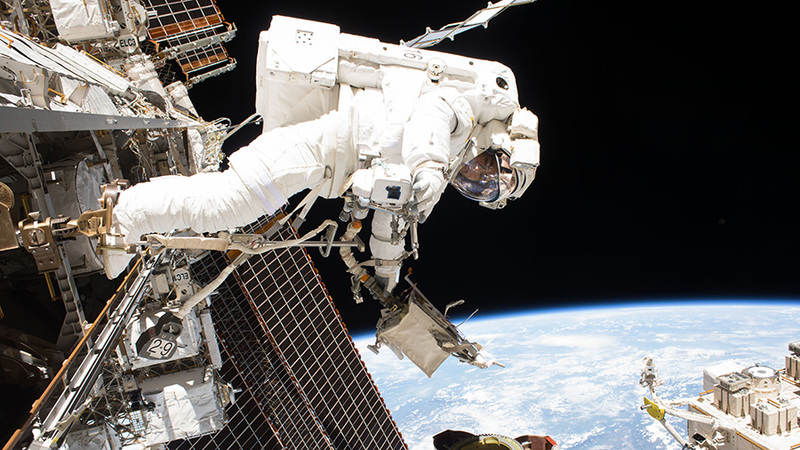 NASA TV will start its live coverage of the spacewalk activities beginning at 5:30 a.m. The Progress 69 resupply rocket lifts off in below freezing weather from the Baikonur Cosmodrome in Kazakhstan. 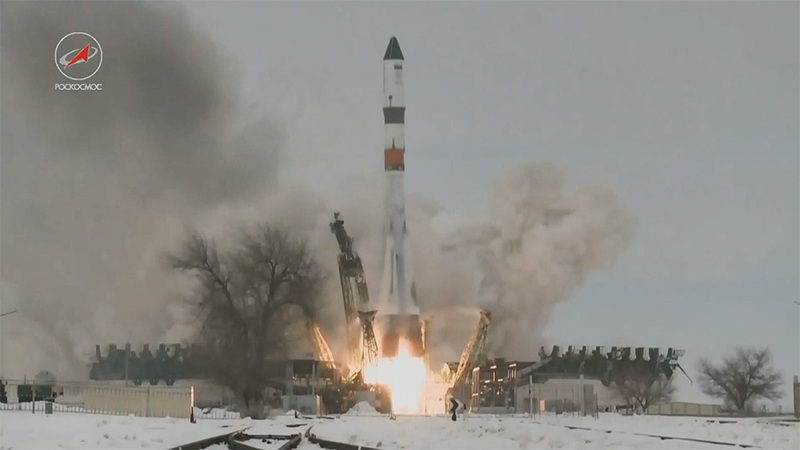 Carrying more than three tons of food, fuel and supplies for the International Space Station Expedition 54 crew, the Progress 69 cargo spacecraft launched at 3:13 a.m. EST (2:13 p.m. local time) from the Baikonur Cosmodrome in Kazakhstan. At the time of launch, the International Space Station was flying over the south Atlantic north of the Falkland Islands at an altitude of 252 miles. Less than 10 minutes after launch, the resupply ship reached preliminary orbit and deployed its solar arrays and navigational antennas as planned. The new Progress spacecraft will remain at the orbiting laboratory until late August. To join the online conversation about the International Space Station and Progress 69, follow @Space_Station. To learn more about the space station and its crew, visit https://www.nasa.gov/station. 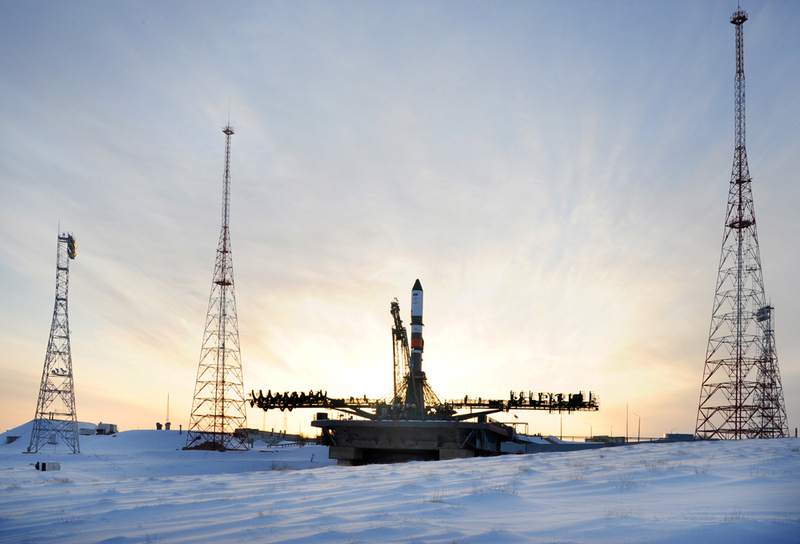 Loaded with three tons of food, fuel and supplies, a Russian Progress cargo spacecraft is scheduled to launch at 3:13 a.m. EST (2:13 p.m. Baikonur time) Tuesday, Feb. 13, to resupply the International Space Station. The previous launch attempt on Feb. 11 was automatically aborted shortly before liftoff. The rescheduled launch from the Baikonur Cosmodrome in Kazakhstan will be carried live on NASA Television and the agency’s website beginning at 2:45 a.m. The Progress 69 cargo vehicle will dock automatically to the aft port of the Zvezda service module of the station two days later at 5:43 a.m. Thursday, Feb. 15. NASA TV and web coverage will begin at 5 a.m. The new Progress spacecraft will remain at the orbiting laboratory until late August. 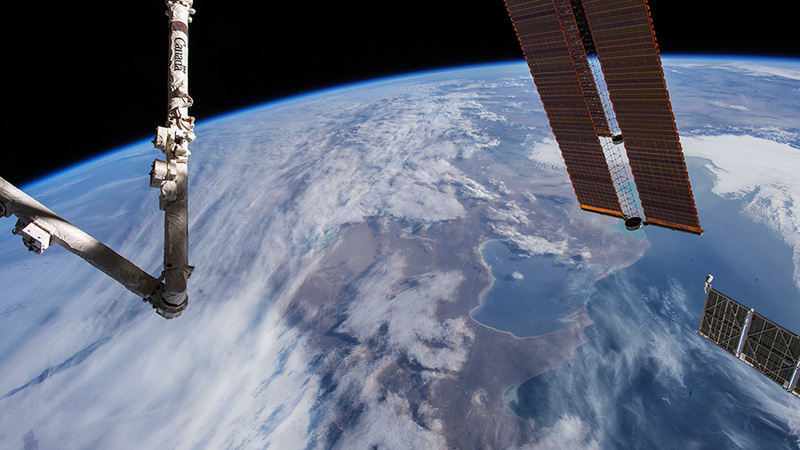 The Caspian Sea is pictured below the International Space Station as it orbited 253 miles above Earth’s surface. The station’s robotic arm (left) and solar arrays (right) are seen in the foreground. A Russian Progress resupply ship to the International Space Station aborted its express delivery mission just a few seconds before launch early Sunday. 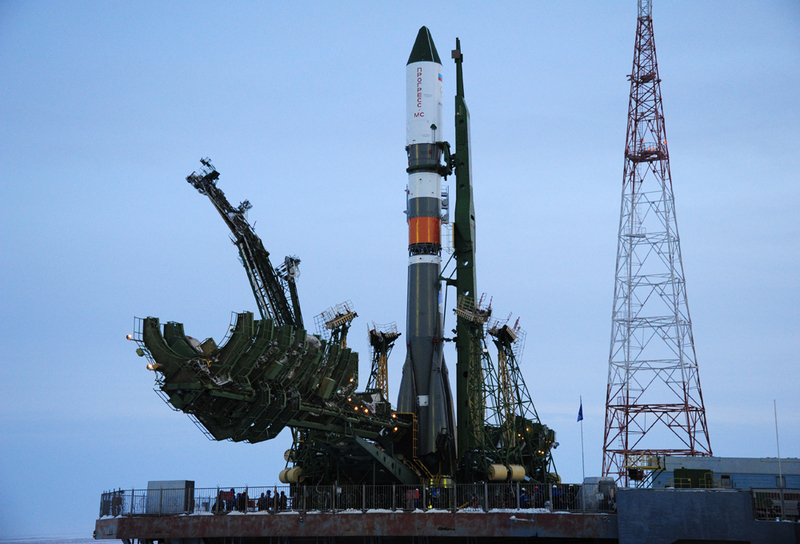 The cargo vehicle will now launch on Tuesday, Feb. 13 at 3:13 a.m. EST (2:13 p.m. Baikonur time) to send three tons of food, fuel and supplies to the station. Live coverage will be provided on NASA TV and the agency’s website beginning at 2:45 a.m. Progress 69 will dock automatically to the station two days later at 5:43 a.m. Thursday, Feb. 15. NASA TV and web coverage will begin at 5 a.m.
Back inside the orbital lab, the Expedition 54 crew continued exploring how living in space affects plants, animals and humans. A pair of astronauts are also getting ready for a spacewalk to wrap up maintenance on the Canadarm2 robotic arm. Flight Engineer Norishige Kanai wrapped up a study that took place last week exploring how mice injected with a muscle maintenance drug may help astronauts in space and patients on Earth. Cosmonauts Alexander Misurkin and Anton Shkaplerov researched how microgravity impacts the human digestive system and how much radiation the space station is exposed to. Kanai and astronaut Mark Vande Hei are also reviewing procedures for their upcoming robotics maintenance spacewalk. 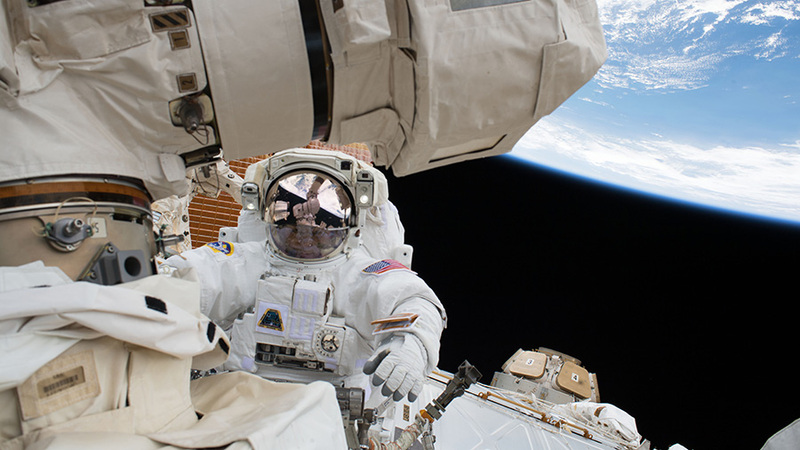 The duo configured spacewalk tools and charged up spacesuit batteries and cameras. NASA astronauts Scott Tingle and Joe Acaba, who will assist the spacewalkers, also trained for their role as robotics controllers. Russia’s Progress 69 resupply ship is pictured standing at its launch pad at the Baikonur Cosmodrome in Kazakhstan shortly after its roll out Feb. 9, 2018. The planned launch of the Progress 69 cargo spacecraft at 3:58 a.m. EST (2:58 p.m. local time) from the Baikonur Cosmodrome in Kazakhstan has been scrubbed. A backup launch date is under review. To learn more about the space station and its crew, visit https://www.nasa.gov/station. A Russian cargo craft is getting ready to roll out to its launch pad for a Sunday morning lift-off to resupply the International Space Station and the Expedition 54 crew. The astronauts and cosmonauts aboard the station are also preparing for the new space shipment and continuing a variety of life science studies. 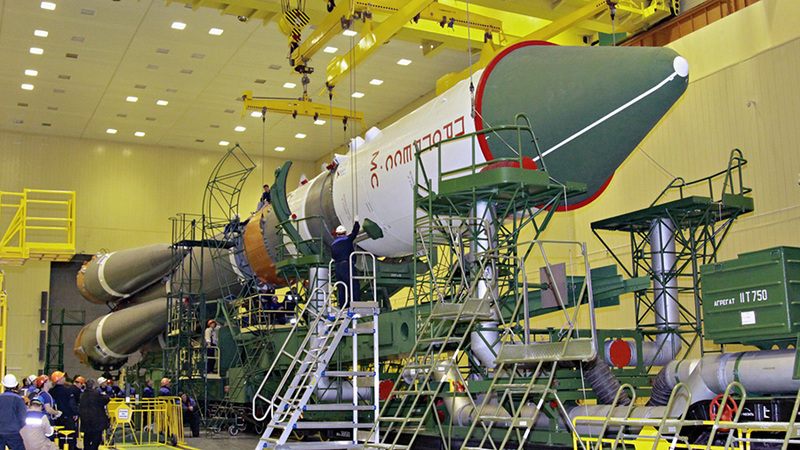 Russia’s Progress 69 (69P) resupply ship is in its processing facility preparing to roll out to the launch pad Friday at the Baikonur Cosmodrome in Kazakhstan. The 69P is due to lift-off Sunday at 3:58 a.m. EST (2:58 p.m. Baikonur time) reaching the International Space Station in record time just three and half hours later. Cosmonauts Alexander Misurkin and Anton Shkaplerov trained today for Sunday’s Progress’ automated rendezvous and docking set for 7:24 a.m. The duo practiced using the station’s telerobotically operated rendezvous unit in the unlikely event the Progress would need to be manually docked to the Zvezda service module. Mice and plant studies are still under way this week to help researchers understand how organisms respond to living in space. Data collected from the space biology and botany studies may improve health treatments, benefit a wide variety of industry sectors and help NASA plan journeys farther into space. Astronauts Scott Tingle and Norishige Kanai continued partnering together researching how a muscle maintenance drug affects muscle growth in mice living on the orbital lab. Results of the drug study may help combat muscle weakening in space and on Earth. Two-time station resident Joe Acaba processed and stowed samples for the Plant Gravity Processing experiment. The botany study is exploring how plants grow and how their roots orient themselves in outer space. ESA’s Columbus lab module is pictured (clockwise from top left) in the grips of the Canadarm2 before its installation at the station; being serviced during a spacewalk by astronaut Randy Bresnik; close-up of Columbus attached to the starboard side of the Harmony module; attached to Harmony. 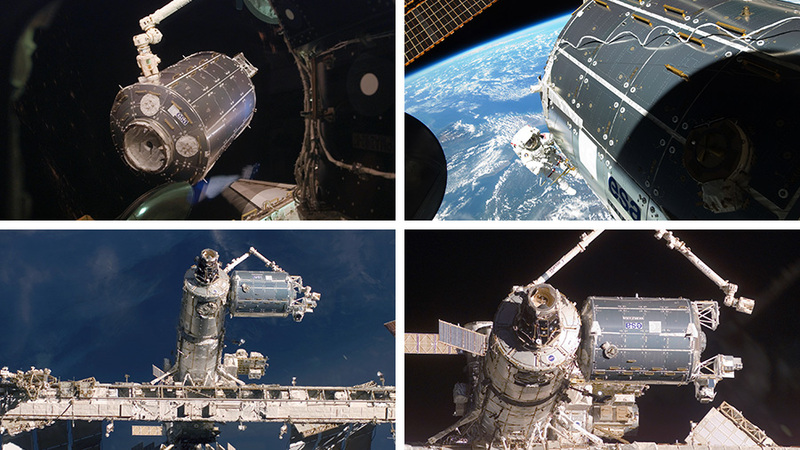 The European Space Agency (ESA) is celebrating today the 10th anniversary of the launch of its Columbus lab module aboard space shuttle Atlantis to the International Space Station. Now Columbus is one of three lab modules supporting hundreds of advanced microgravity science experiments. The other two modules are Destiny from NASA and Kibo from the Japan Aerospace Exploration Agency. To commemorate today’s event, ESA’s former Director of Human Spaceflight Feustel Beuchl called up to astronauts Joe Acaba and Mark Vande Hei today and asked about the status of Columbus operations. Scientists Lars Karlsson and Alexander Stahn inquired about a pair of ESA-sponsored experiments researching airway inflammation and circadian rhythms. Wednesday’s science onboard the station looked at how living in space affects vision and muscles. Two cosmonauts used special optical equipment to peer inside each other’s eyes this morning. The astronauts on the U.S. side of the orbital lab observed mice being treated with a drug to combat muscle weakening in space and on Earth. Commander Alexander Misurkin and Flight Engineer Anton Shkaplerov started their day checking the condition of their retinas using optical coherence tomography (OCT) gear. OCT uses light waves to measure and map the thickness of the retina’s layers. Results will help doctors understand how living in space long-term physically affects the eyes and vision. Astronauts Scott Tingle and Norishige Kanai were back in the U.S. Destiny lab module today studying a drug that may prevent muscle atrophy in space and help patients on Earth with muscle ailments. Mice living on the station for up to two months are treated with the muscle maintenance drug. The mice are returned to Earth aboard a SpaceX Dragon cargo craft for analysis to determine the drug’s effectiveness.